Nigel Atangana has told Andy Awford: There is plenty more talent available in non-league football. 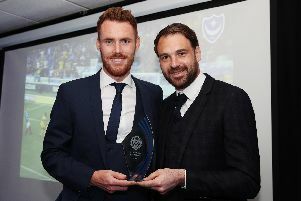 The Pompey midfielder was plucked from non-league neighbours Hawks in the summer for a fee of around £20,000 and has shown himself to be well capable of making the step up to the Football League. And the 25-year-old insists there are more players where he came from who just need to be given the opportunity to prove themselves at the higher level. Atangana said: ‘There are some players I have played against in non-league football who can play in the Football League – definitely. ‘It’s just about getting that chance. ‘I remember I played against Ebbsfleet last season and they had some very good players. ‘I also played with Christian Nanetti at Havant, who is at Dover now, but he is very good on the ball. Although many non-league footballers have dreams of turning pro, it also suits many of them to play semi-professional while holding down a regular job. But Atangana, who had to be patient to get his own opportunity, has offered his advice to those who want to make the jump into the full-time ranks. He said: ‘When you play for a non-league team, you need to think like a professional player. ‘Last season I went to the gym all the time or went running on my own – things like that. ‘Sometimes it was hard to do that. ‘You have to think “if I train hard, I can play at a higher level”. ‘But you have to think like that every day. Pompey have had their success in identifying players from non-league football in the past but they have not been frequent. And while the gap in standard was perhaps too far to bridge during the club’s many years in the top two divisions, some believe they have not tapped into a useful resource often enough in recent times. Ryan Bird was the last player to attempt the switch, after joining from Burnham but he was allowed to leave by Awford at the start of the season to join Cambridge. Atangana, meanwhile, admits he wasn’t plotting his way to Fratton Park when he signed for Lee Bradbury’s men in 2013. ‘Of course, I heard about the club a lot as I was in the area,’ added the midfielder. ‘Perry Ryan was in the Academy and told me a lot about it. ‘A few people said “if you play well, maybe Pompey can watch you” but I didn’t think about this.